After primary school, the children of Addiewell all went our different ways in high school. Some of the children from St Thomas' went to Bathgate to St Mary's and some to St Mary's in West Calder. I expect that the lessons were much the same, depending on which stream each child was in. The public school people went to West Calder High. This was the old school on the Hartwood road. For most of us, after three or four years hard labour it was time to look for paid work. This was in the late fifties or early sixties. Addiewell being a small place, did not offer much in the way of employment, especially for the girls. Many had to travel to other places and this is where the trains came into their own. The fifties saw many young people making their way to the station in the early morning. The walk from the top of Loganlea was a fair step and even further for the girls from Stoneyburn. 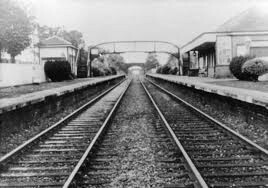 There were two routes to the station- one through Addiebrownhill to the ashy path, which ran alongside the railway and down into the station, the other was to cut down behind Livingstone street to Station Road. The Stoneyburn people came over by the metal viaduct and followed the work railway round to Station Road. Many worked in the laundries, biscuit, and bread factories around the Slateford area of Edinburgh. The morning started with an early rise as we had to leave the house by 6:30am (earlier for some) to catch the 7 o'clock train at Addiewell. This arrived at Slateford around 7:40am leaving twenty minutes to get to the work place to start at 8am. The return journey was: finish work at 6 pm, walk to station for train at 6:20 pm, arrive at Addiewell at 7 pm, walk home arriving around 7:30 pm. A total of 13hours a day five days a week. All for (at fifteen years old) £2/18 shillings. In the winter these young people never saw daylight except in their lunch hour and at weekends. The girls who worked in shops like C & A caught the train an hour later, but they had to work on Saturdays with a half day off during the week. Long hours for young people, but we survived. The train fare from Addiewell to Edinburgh, for a weekly pass, was 18 shillings. A big lump out of the mean wages. However, this pass could be used at any time and the factory workers often took advantage to visit Edinburgh on a Saturday. In the winter we would leave Addiewell, trudging through deep snow in our fur boots to cleared streets when we arrived at the Cally station near Princes Street. We had to carry shoes to change into for work. The half hour journey on the train actually was quite a social gathering as we met many young people from the surrounding areas like Fauldhouse, Stoneyburn and even Shotts. This was the beginning of our working life. This page was added by Margaret Foster on 23/11/2012. I have been waiting on Margaret's update of life in Addiewell and the surroundings. I well remember the walk every single morning to Addiewell station in rain, hail, sleet or snow. I left school and went to a Training school in Edinburgh to learn to be a comptometer operator. My parents had to save their hard earned money to send me there and I had no choice in the matter, I had to learn a skill. My first job was in Edinburgh, I got £3.00 a week which I handed over to my mother and got pocket money back, this got me to the Poly on a Saturday night and not much else. I caught the early train and envied all the students going to Heriot Watt and Edinburgh University- they seemed so clever and talked non stop. One morning I was traveling with Kit McKee, she worked in one of the sweetie factories and she was wearing a huge knuckle duster of a ring with a huge orange stone in it, needless to say no jewellery was allowed apart from wedding rings. I met her again on the return trip to Addiewell and there was the ring but no stone in it, when I mentioned it to her she said "no one noticed it as I was making puff candy and it is the same colour" we laughed all the way home thinking about some poor sod breaking their teeth on Kit's precious stone! She was a character! As you said we left in the dark and returned in the dark in the winter months, but no harm came to us and it surely toughened us up. I always liked the Cally station with its' booths selling fags, papers and sweets and of course the steam trains waiting to take us all home. Keep your memories coming I love them. Hi did you know my mum and dad ? Addiewell men who've made a name for themselves in the beautiful game.